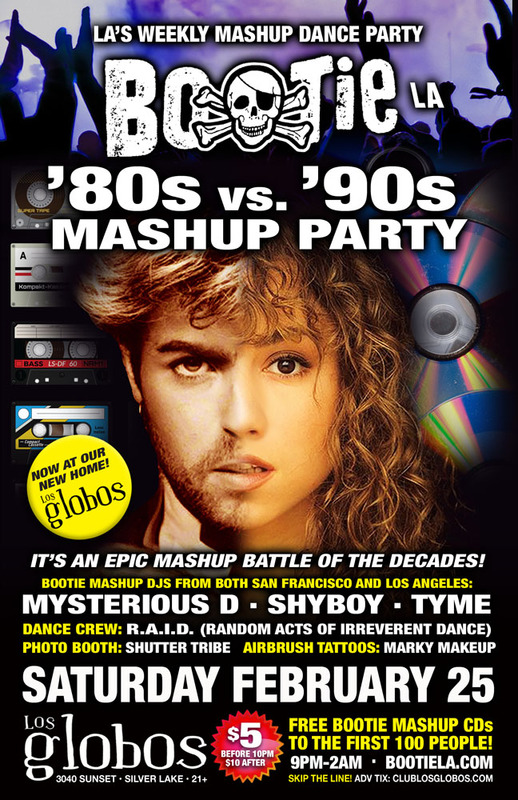 BOOTIE LA @ LOS GLOBOS: ’80s vs. ’90s Mashup Night! Los Angeles BOOTIE LA @ LOS GLOBOS: ’80s vs. ’90s Mashup Night! Bootie takes two of our most popular theme nights and mashes them together – it's '80s vs '90s Mashup Night! Why choose one when you can have them BOTH ... mashed up, of course! Bring your pastel polo shirts and acid-washed overalls, plastic pants or ripped jeans, leg-warmers or leotards – all the wonderful and awful fashion of two extremely colorful and fun decades! Only $5 before 10 PM! It’s ’80s vs. ’90s Mashup Night at Bootie LA, where Bootie co-creator Mysterious D joins LA resident DJs ShyBoy and special SF guest DJ Tyme to mix and mash all the ’80s and ’90s genres with music from multiple decades, paying homage to the eras yet keeping the music fresh! Resident dance crew R.A.I.D will be giving ‘80s and ‘90s realness, plus Marky Makeup will have airbrush options from both decades, and Shutter Tribe will be there to capture it all! All this, plus FREE Bootie mashup CDs for the first 100 people through the door!